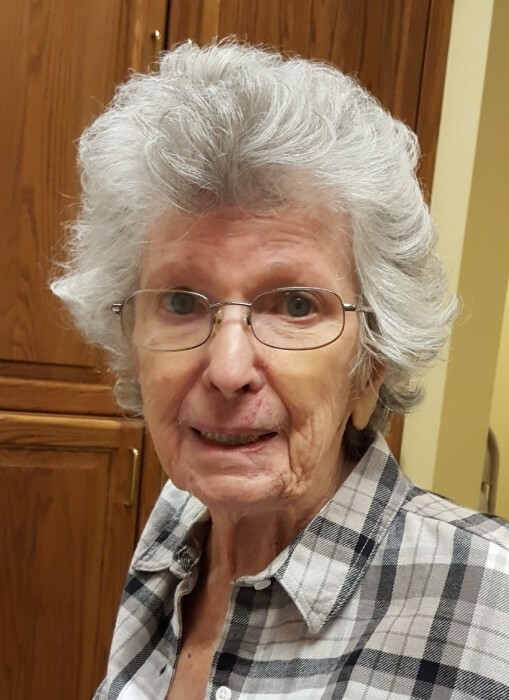 Shirley M. Betschler, 91 of Jefferson, loving wife, mother, grandmother, and great-grandmother, died peacefully on Friday, March 15, 2019. Shirley was born on January 14, 1928 in Fort Atkinson, the daughter of Irving and Dorothy (Floerke) Streich. On April 30, 1949 she married Wilbert Betschler at St. Paul’s Lutheran Church of Fort Atkinson. The couple had 2 children and enjoyed 37 years of marriage until his death in 1986. She worked alongside Wilbert on the farm for many years but moved to Jefferson soon after her husband’s death. Shirley came from a family of 12 and learned the meaning of hard work from an early age. She preferred to be behind the scenes as a supporter and helper. She was a content laborer and found joy in easing the efforts of others. Her family remembers her willingness to give of her time and talents. She helped her family at every opportunity; whether it be sewing an outfit, wallpapering a room, cooking, or offering her last quarter to her children or grandchildren. She was a longtime and active member of St. Peter’s Ev. Lutheran Church of Helenville, where she served faithfully with the Ladies Aid. Shirley’s priority was taking care of her family and her dedication and endless love will be deeply missed. Her family finds comfort in knowing she is now with her Savior. She is survived by: her daughter Kathleen (David) Wiegand of Jefferson; grandchildren Kerry (Andrew) Osmond, Luke (Melissa) Seifert, and Amanda Seifert; great-grandson Gabriel; sister Beverly (Jerry) Kraus of Hot Springs, AR, and sister-in-law Evelyn Streich of Jefferson. She is also survived by a number of nieces, nephews, other relatives and friends. Shirley is preceded in death by: her parents, husband, son Kenneth in 2015, and siblings Darlene Krause, Charlotte Roth, Mary Dailey, Rose Meyer, Loretta Mittelstadt, Karen Thone, Lloyd, Melvin, Carroll, and Dean. A memorial service will be held at 11:00AM on Saturday, March 30, 2019 at St. Peter’s Ev. Lutheran Church of Helenville with Rev. Mark Swanson presiding. Visitation will be on Saturday from 9:00AM until the time of service at the church.